First, check out my depth of field, yo. Our children is learning! Second, I’m sorry about the aspic. But the Smackdown must ever explore the new and exciting, or in this case old and vile. Fourth, Lillet (a French apertif wine) on ice, maybe with a spritz of seltzer, is my new official drink. The shiznit. Also, I really am sorry about the aspic. … I don’t get it. The aspic. Why did that sauce need to be gelatinized? And why was it served cold? I’m curious how that even sounded good in conception. 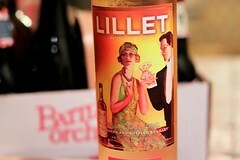 And I always thought Lillet(s) was a feminine hygiene product. And for that reason I could no way drink that stuff.